Flexible Gooseneck allows multi directional aiming. 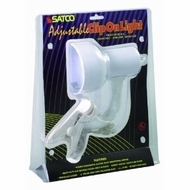 Heavy duty clip securely holds light in place. Rotary on/off switch on shade. Porcelain Socket and 6' coiled wire with polarized plug.